Reasons for concern: This plant forms dense monocultures, which displace native plant species and reduce biodiversity, wildlife habitat, and forage production. Its very extensive root system makes it very difficult to control once it has become established. All roots can develop buds that can turn into rhizomes and shoots. It is also toxic to cattle. Classification: Non-native. 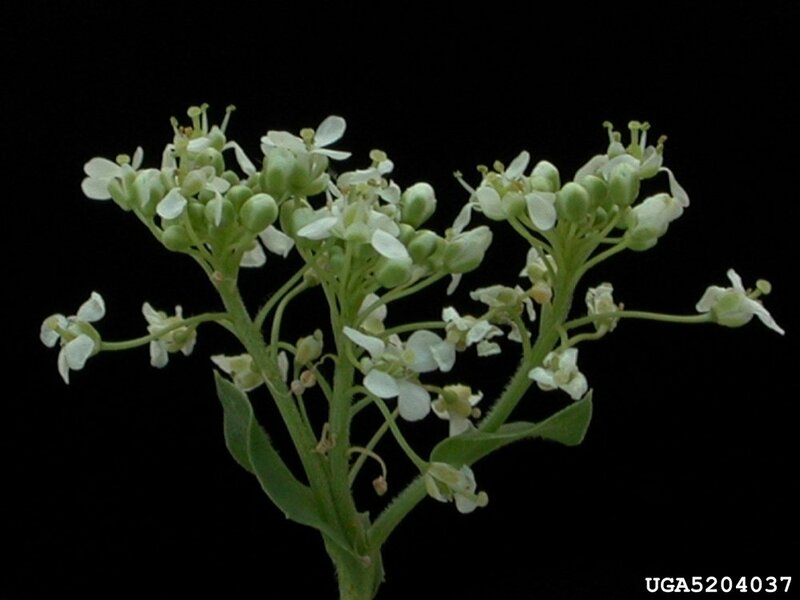 Included on the Arizona Noxious Weed List as Cardaria draba. Botanical description: Upright, broadleaf, herbaceous plant, flat appearance with numerous stems, forming dense colonies. Leaves: Grayish-green, arrowhead-shaped from ¾ inch to 3 inches long. Smaller upper leaves with two lobes that clasp stem. Leaves lower on stem longer and attached with short stalk. Stem(s): Stem grows to 24 inches, or smaller in dry sites. Slightly hairy. Multiple stems from base. 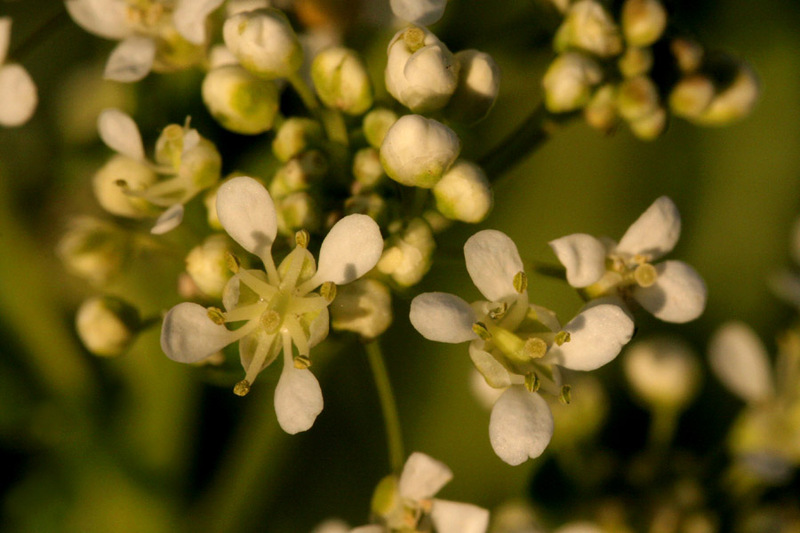 Flowers: Numerous small, fragrant white flowers with 4 petals, in dense flat-topped clusters atop plant. Gives plant a “white topped” appearance. Usually blooms in April through August. Seeds: Seed pods heart-shaped and tipped with a beak. Seeds mature in June to July. Roots: Extensive system of persistent, deep, vertical and horizontal roots (rhizomes) that easily produce new shoots at irregular intervals. Root fragments generate new plants. Only ¼ of the plant is seen above ground. Where it grows: Commonly in dry, disturbed, alkaline soils but thrives in a variety of other soils with good moisture conditions. Likes sun. Elevation 3,300 to 7,900 feet. 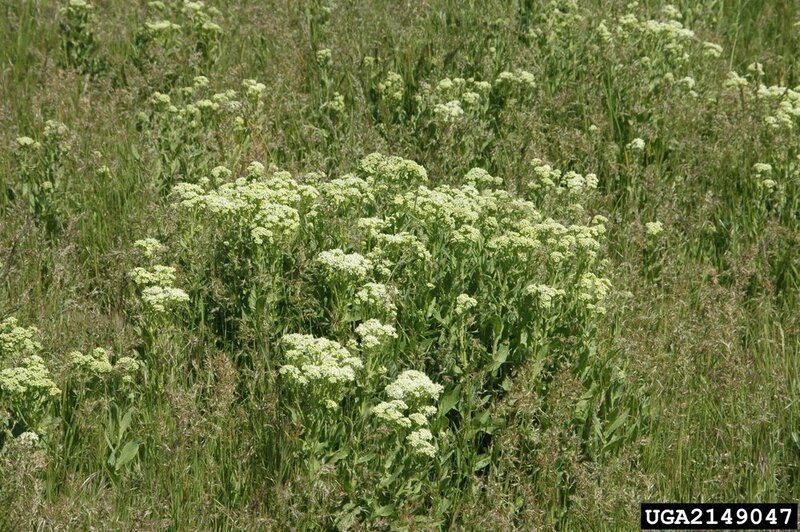 Weedy characteristics: Whitetop can withstand extensive drought. It can flower and drop seed a second time in late summer and the seeds endure for many years. The root system is vigorous and difficult to eradicate. Rhizomes spread up to 12 feet in one year, and send up many shoots (up to 400 annually) that act as new plants. Both seeds and roots can be carried on equipment to new sites. 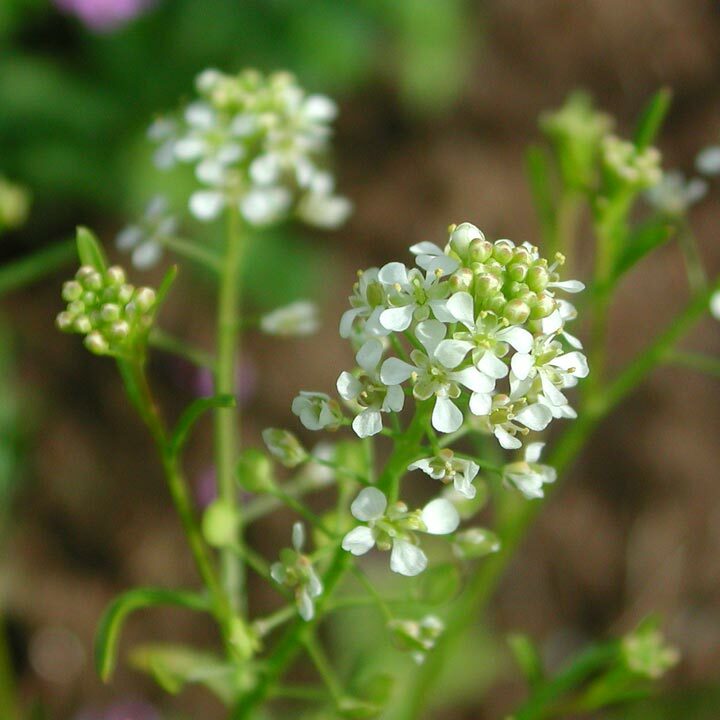 Look-alike native plants: There are several native pepperweeds (Lepidium spp.) in Northern Arizona. The leaves of common native species do not clasp the stem. Control strategies: Dig or pull individual plants for small infestations, taking care to remove all the root. Monitor frequently as remaining roots can produce new plants. Mow to reduce seed production and till to reduce plant density. Several herbicides are effective on actively growing plants but must be used for several years. Contact your local county extension office for more information on chemical control.